At a rally in Portsmouth, New Hampshire on Tuesday, Sen. Bernie Sanders did what nearly everyone who has interviewed him over the past month has tried to get him to do. He officially and unequivocally endorsed Hillary Clinton for president. A #SelloutSanders tweetstorm erupted, as many of his supporters felt betrayed by the endorsement, and concluded that Sanders had gone back on everything he stood for. But Sanders didn't sell out on me — he did what he said he'd do all along. And though I might disagree with his reasoning, I'm still grateful for his candidacy. Sanders pledged repeatedly throughout the beginning of his campaign in 2015 and beyond not to run as an independent should he lose the Democratic primary, and to endorse the eventual nominee. He often alluded to "lesser-evilism" as his reason, stating that Clinton would make a better president than a Republican. As Donald Trump rose to become the GOP's presumptive nominee, that rhetoric strengthened. It is no secret that Hillary Clinton and I disagree on a number of issues ... But I am happy to tell you that at the Democratic platform committee, which ended Sunday night in Orlando, there was a significant coming together between the two campaigns, and we produced, by far, the most progressive platform in the history of the Democratic Party. Our job now is to see that platform implemented by a Democratic Senate, a Democratic House, and a Hillary Clinton president – and I am going to do everything I can to make that happen. Sanders believes that the Democratic Party can become more progressive. He believes that the more-progressive-than-ever party platform will impact politicians — though it's purely a messaging document, and does not bind any politician or candidate to its positions. 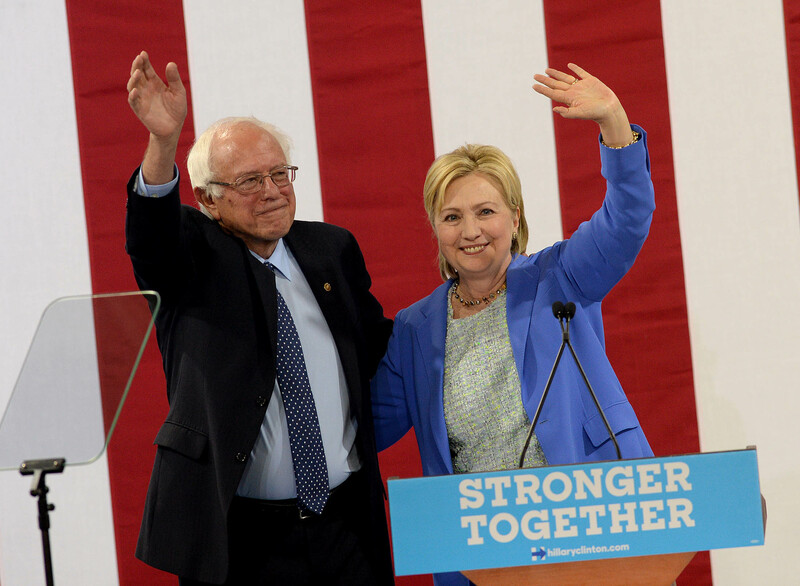 And Sanders believes that Clinton will do her part to implement that platform as president. Yes, this is in rather stark contrast to Sanders' language on the campaign trail, describing Clinton as the "establishment candidate" who could not be trusted to implement progressive policy concerning Wall Street, foreign policy, and campaign finance reform. And it seems to have tension with his talk of "revolution" — of overhauling systems rather than settling for incremental progress. It's clear that Sanders thought himself the better candidate to push for leftist policies. But, unlike many of his supporters, he appears to now have faith in the potential for the party, and its nominee, to fundamentally shift left. I never thought I would vote for a major-party candidate. On March 1, I walked down the street and around the corner to cast my first-ever primary vote, and my first-ever vote for a major-party presidential candidate. That's because Sanders is something of an outsider on the inside. His decades of political experience as an independent gave him an "in," but he didn't weaken his firm progressive stances, which broke the boundaries of the Democratic Party, during his bid. And I believed that, as president, Sanders would work for more progressive change than any typical Democratic president would. Am I convinced that the newly-drafted party platform is more than a hollow gesture to appease Sanders and his supporters? Not really. Am I convinced that Clinton will be a progressive president? Not at this time. I'd like to see disenchanted Sanders supporters put our energy into dismantling the two-party stronghold through initiatives like VotePact and pushing for instant runoff voting, which would make it easier for third-party and independent candidates to succeed. Sanders is trying to change the two-party system from within, whereas I and many of his supporters are skeptical of the party's ability to change fundamentally — at least during this election cycle. This doesn't mean that he is reneging on any of his positions. It doesn't mean he's going against his word (quite the contrary, in fact). It's a disagreement of strategy and a distinction of faith. I likely won't be following Sanders' lead in voting for Clinton in November. But he didn't sell out on me.